In the weird and wacky world of advertising, it staggers me how many ideas that look good on paper become fatally flawed in execution. 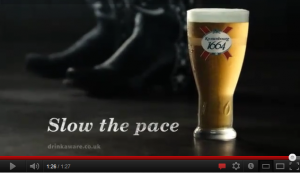 The current campaign for lager brand Kronenbourg 1664 is a case in point. It’s classic advertising by numbers. Think of a tagline that captures the brief – in this case ‘slow the pace’ to cover off a premium beer that’s made to be savoured rather than rushed. Next think of an idea that brings that line to life. Hey guys, I know – let’s take classic songs and slow them down. Better still, have the original bands perform them and let’s set it all in a pub. Sounds perfect, except it’s completely dependent on how well the music’s done. There are two executions at the moment. Motorhead performing a slow rearrangement of ‘Ace of Spades’ and Madness with a re-imagining of their classic hit ‘Baggy Trousers’. One ad works. The other fails miserably. Let’s concentrate on the failure, and as a Madness fan in the 80’s I hate to say it, but Suggs and co have come up with a song that falls as flat as a pint of Top Totty in a gay bar. The track’s been retitled ‘ Le Grand Pantalon’ which, along with the reversible beret that transforms into a pork pie hat, is one of the few lighter moments in a dull, boring ad that doesn’t bear repeat viewing. Set in a French bar, that appears to have a reasonably good vibe until ‘the boys’ start playing, the mood soon changes and depression sets in. Suggs sings the lyrics at funereal pace whilst staring into a full pint of lager. Another member of the band uses his glass as a percussion instrument. In a homage to the band’s crazy videos of the past, saxophonist Lee Thompson is slowly lifted from his chair by a wire attached to the ceiling fan. Maybe he’s got the right idea and is contemplating suicide to escape the boredom. Somewhat bizarrely nobody drinks and the band exit like a bunch of geriatrics from a rave at the end, leaving their full pints of Kronenbourg behind – which doesn’t say much about the beer. The Motorhead commercial featuring ‘Ace of Spades’ fares far better. Mostly because Metal and Blues aren’t that far away as music genres. The track appears to be appreciated by the audience and adds to the laid back atmosphere of the bar rather than brings it to a standstill, which is what happens in the Madness ad. I’m not sure how many people have downloaded the free Madness track, but it’s hard to believe it’s actually done the band or the brand any favours. Watch Motorhead Slow The Pace. Next post: Time for a holiday ?